Though it is regularly commissioned and performed by leading artists Geoffrey Poole's music has been rarely recorded. Some may remember Peter Lawson's recording of his piano piece Ten (ECR 001 nla). More recently recordings of his band piece Sailing with Archangels (Serendipity CPVP 004 CD) and of his Second String Quartet (A.S.C. CS CD 11) have been released whereas his delightfully entertaining Skally Skarekrow's Whistling Book for recorder and piano is now available on FORSYTH CD FCD 001/2. However this is the first CD entirely devoted to his music (all these works were written in the late nineties). The Impersonal Touch for two pianos (1995) is a good example of Poole's approach. He says that he is "always fascinated by the drama of bringing incompatible things together and seeing what happens". That is actually what happens in this piece. "Piano 2 sets off to explore some rather elusive drumming riffs in an almost minimalist way (i.e. 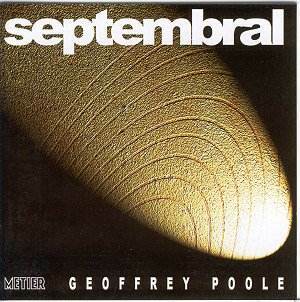 the "impersonal touch") whereas Piano 1 introduces a totally different attitude" (Geoffrey Poole). The first piano's part is full of contrasts of all sorts, at times verging on fanciful improvisation while the second piano provides a varied continuum on which the first piano builds its flights of fancy. A very engaging piece indeed and a good introduction to Poole's music making. Septembral is scored for bass clarinet, violin, cello and piano. It was written in 1993 (with revisions in 1997) as a tribute to Gemini's director Ian Mitchell who is also a bass clarinet player. To quote Poole again: "it balances a full-blooded expressivity and wide-ranging melodic lines with intricate rhythmic activity at the surface; and it unfolds as a chain of characterised tableaux in open form." It is a brilliantly and technically demanding piece. It may be a tough nut to crack, but well worth cracking, for Poole's music in spite of its demands of all sorts is also much concerned with communication which it often achieves through its sheer vitality, no matter how technically complex it may be. This is also quite obvious in the substantial Third String Quartet (1997) which, as far as I am concerned, is the finest piece in this release. It is a quite different piece from its predecessor which Poole refers to as his "sunny 'Gambian' second quartet". Poole explains that the nine sections of the piece are loosely based on the eight tides of a Saxon sundial. "They follow a circular path from pre-dawn, through the energies of the day to a black if moonlit night." At the centre of the piece is a "noontide meditation on the rune Wyrd (Fate)". The Third String Quartet opens with a beautiful viola incantation preceding the first shafts of light, leading to more animated music. At the centre of the piece, comes the already mentioned meditation ("at the still point of the turning world"). The music slowly retraces its progress towards darkness and the piece ends with another incantation, played this time by the cello. Full circle is thus achieved. The music of the Third String Quartet has a good deal of invention and imagination, and is full of subtle, at times elusive shades, all wrought in beautifully inventive string textures. By comparison the Second String Quartet sounds much more straightforward when compared to the understatement found in the Third String Quartet. I would like to hear the First String Quartet. Poole has a lasting admiration for the Lindsays who in turn served his music well, since the three quartets and the piano quintet Harmonice Nundi were all performed by them. Their understanding of and sympathy for Poole's music is evident throughout this beautifully committed reading. The last piece is a short item for oboe and piano Firefinch completed in 1999. This is indirectly another product of Poole's African period. Again it is a beautifully written piece stretching the players' resources to the full but the result is nevertheless a colourful, evocative piece of music. All the performances are consistently fine as is the recording quality. This release is most welcome: Poole is a very interesting composer whose music has a strong power of communication in spite (or because) of its huge stylistic variety. To quote Giles Easterbrook : "A maverick perhaps, but a rewarding, intriguing one". We welcome feedback on our reviews. Please use the Bulletin Board. Please paste in the first line of your comments the URL of the review to which you refer.This is the only part of MusicWeb for which you will have to register.